Printed by William Porter, for Mess. White, Gilbert [etc. ], Dublin, 1777. Printed by Charles Bill, and Thomas Newcomb [etc. ], London, 1689. The Irish Jurist, Dublin, 1980. New Ireland Forum, Dublin, 1983. D. & J. Sadlier & Co., 164 William Street [etc. ], New York, 1857. Printed and Sold by J. Oliver, London, 1752. The An glo-Irish Agreement 1985 - Blue Print or Green Print? Northern Ireland Legal Quarterly Inc., Belfast, 1986. Printed by P. Byrne, 108, Grafton-Street, Dublin, 1786. Printed by Charles Bill and Thomas Newcomb [etc. ], Lodnon [sic], 1689. 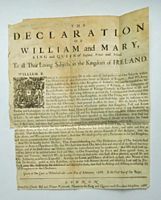 William's immediate, unsuccessful effort to defuse the Irish rebellion as James arrived from France, followed by the siege of Londonderry, the battle of the Boyne, and the Articles of Limerick, "show[ing] how precarious was the Revolution settlement"
National Council for Civil Liberties, London, 1975. Her Majesty's Stationery Office, London, 1973. The Irish Jurist, Dublin, 1972. National Council for Civil Liberties, London, 1974. E. Ponsonby, 116, Grafton-Street, Dublin, 1881. Her Majesty's Stationery Office, London, 1972. The Irish Jurist, Dublin, 1978. Printed by and for Andrew Crook [and two others], Dublin, 1700. Printed by James Partridge, Matthew Gillyflower [and one other], London, 1689. National Council for Civil Liberties, London, 1973. Her Majesty's Stationery Office, Belfast, 1969. Imprinted by the Society of Stationers, Dublin [a false imprint, i.e. London], 1636. Printed and Sold by Geo. Grierson [etc. ], Dublin, 1735. Stevens & Sons Limited, New London, 1982.